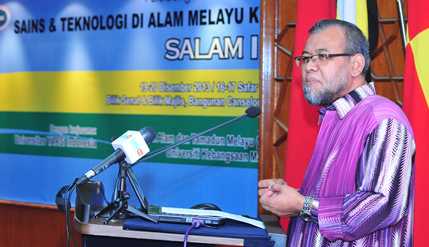 BANGI , 19 Dec 2013 – Bahasa Melayu must remain as the medium for learning science and mathematics at primary and secondary levels . Prof Dato’ Dr Yusof Hj Othman from Universiti Kebangsaan Malaysia ( UKM ) said efforts to prioritize the native tongue is worthwhile and has brought educational and economic transformation to Malaysia for 30 years. During his keynote address at the two-day 3rd International Conference on Science and Technology in the Malay World sponsored UKM here today Prof Dr Yusof thinks the national education system will be interrupted if the instruction medium is changed back to English. According to him , many developed countries do not use English as the medium of instruction even at university level . Studies in languages ​​other than Malay language are more useful for researchers and academics in universities because they have to refer to international journals and articles . “For the school students, they don’t need to study from materials in other languages ​, while all they need can be found in the Malay language, ” he pointed out. In the meantime Malaysians continue to learn the English language as a subject in primary and secondary schools and that would be sufficient to equip them to enter university . ” It has been proven that graduates can learn all subjects in Malay while still being able to understand the information provided in the English language as found in the reference books and international journals, because they also learn English since at school,” he stressed. Even developed countries such as Japan , Germany and South Korea managed to publish scientific findings in their own native language that other researchers can read through the translation of the articles. He stressed the struggle for the Malay language would never end and had been successful with the establishment of UKM in 1970 . It is a setback if English is re-introduced for science and mathematics as the primary language. He denied claims that the country will become backward if science and mathematics are not studied in English. More than 30 academics and researchers of Malay studies took part in this conference jointly organised by UKM’s Institute of Malay World and Civilization (ATMA) and Universitas Yarsi Indonesia. It was inaugurated by UKM Vice-Chancellor Prof Tan Sri Dato’ Sri Dr Sharifah Hapsah Syed Hassan Shahabudin.